As rich countries declare ‘ambition’ while racing to weaken the text, some climate justice campaigners are turning their backs on the COP21 negotiations and looking elsewhere for hope, reports Morgan Curtis. How do we win in Paris? For climate justice organizers that have been fighting both inside and outside this process for many years, there are two answers. One way is making sure that we avoid the worst possible deal, while remembering that, as Lidy Nacpil from the Philippine Movement for Climate Justice puts it, ‘no outcome in Paris is better than celebrating a very bad outcome in Paris.’ The other way that we win is by demonstrating the strength and power of our movement to keep fossil fuels in the ground, regardless of the outcome. This Saturday, thousands will take to the streets of Paris to loudly articulate this intention. What was Avaaz talking about? Their email asked readers to sign a petition that would send an SMS to delegates from China, Brazil, India, and South Africa currently sitting in the final hours of negotiations. One for every 10,000 signatories. Their reasoning? We need to put pressure on them so that they ‘know they will be blamed for killing this deal.’ The ask? For the four countries to join the ‘high ambition coalition’: 15 countries (although they misleadingly announced themselves as 100) that secretly came together six months ago to scheme for what they term an ‘ambitious’ deal in Paris. The group, which includes the US, Germany, Tuvalu, and the Marshall Islands, revealed itself on Tuesday as intent on driving through an ambitious agreement. 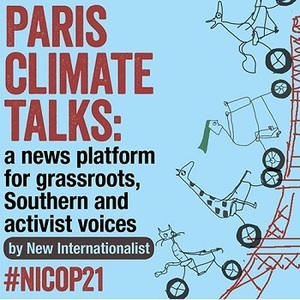 The US is one of the most heralded members of this new coalition, and US chief negotiator Todd Stern described the group as ‘exactly what we need right now’, according to Climate Home. While he was attempting to suggest that the old divide between developed and developing countries has been crossed, it was clear which ‘we’ he was talking about. The so-called ‘high ambition’ this group is calling for has been coupled with an aggressive push from the US to kick ‘differentiation’ out of the text. This term refers to the leadership on emissions cutting needed from the Global North due to their historical responsibility for the climate crisis. These empty words on ambition were rejected yesterday by the largest protest yet seen in the Climate Generations space just outside of the conference. More than one hundred people came together chanting ‘rich countries, do your fair share’ and ‘climate justice now’ while holding placards demanding equity and finance. Speakers at the protest specifically targeted the hypocrisy of the US, calling out their agenda of wanting to be perceived the hero of this conference while undermining the voices and positions of the world’s most marginalized. ‘Human rights and 1.5C do not exist without historical responsibility and equity. We call out groups believing the lies and false solutions proposed by the US,’ said Julian Velez of Earth in Brackets to loud cheers. The world’s media is already working to paint the heroes and villains of this year’s carnival of horrors. The headlines of Paris being a ‘success’ were pre-written months ago, when business leaders and politicians began to step up and propose solutions that would secure their profit-margins and legacies respectively. As the US and the EU continue to employ divide-and-rule tactics, pitting Southern countries against one another in a race to weaken the text, it is important to be clear about the historical context of the complex situation. There are only a few countries that are complicit in all two hundred years of runaway extractivism that bring us to this crisis point in the human story. With the final draft of the Paris Agreement due today, a few things are already certain. The world’s most impacted peoples have close to given up on screaming for their voices to be heard within this process. The text has no mention of fossil fuels, and we know who is to blame: the corporate interests that have ensured it doesn’t. 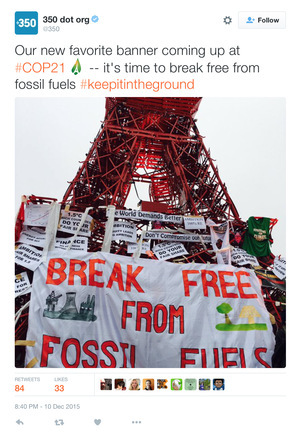 Many of us in the climate justice movement are moments from turning our backs on COP21. While negotiators droned on in plenary halls Thursday morning, across the conference centre an escalation strategy for the movement was made public. In 2016 we will finally break free from fossil fuels. This is how we will win.